As newborn’s grow, they need stimulation when they are awake and alert during the daytime. This is especially true as the move from being newborns to infants. There are multiple options for you to engage in with your baby during their awake times throughout the day. While stimulation is part of the goal of these newborn activities, particular care must be taken to avoid overstimulating your child. 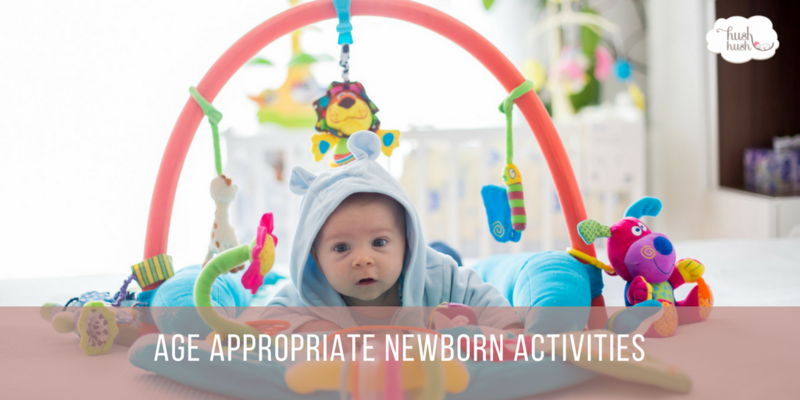 Below are five age-appropriate newborn activities that you can use during your active sessions. While it may seem like a pretty basic item for a baby, a bouncy seat is an excellent place for a newborn to play. Many of them provide stimulation through toys that hang above the seat, and some even vibrate. The straps should be used at all times while in use and keep a close eye on your baby while using these seats. Getting out for some fresh air when weather permits, is one of the best newborn activities you can use to engage your child. While you are out for your walk, your newborn’s senses of sight, smell, touch, and hearing are actively engaged. It also will give you both fresh air and time outside of the house. Be sure you dress baby appropriately and use sunscreen if it is sunny and your child will be exposed. Activity mats and play gyms are also highly recommended on the list of newborn activities. One major advantage of this type of stimulation is that it can be used from day one through their infancy. They are simple to set up and put away making them perfect for small areas. Most activity mats have toys that hang over the top and promote the development of hand-eye coordination after depth perception has developed. Who doesn’t love music? Babies are not immune to the joy that comes from a simple song, and it is a wonderful source of stimulation for babies. Soft, relaxing music or lullabies can also be quite soothing during feedings or near bedtime. Furthermore, it can become a cornerstone of bedtime tradition that can even be passed down through the generations. However, you should use care when it comes to music because it can cause overstimulation if used in excess.